Obesity has become a common problem among children with almost 1 in 3 children struggling to lose weight. Childhood obesity in turn increases their risk of becoming overweight teenagers and developing diabetes and heart disease later in life. Healthy eating and exercise will help your child reach and maintain healthy weight, and prevent obesity. Here are a few tips that will help your child combat obesity. Be a Role Model: Kids love to imitate their parents. Inculcate good habits in them by acting as a role model. Make healthy food choices and follow an optimum lifestyle. Do Not Bribe Your Kid with Food as Rewards: Avoid rewarding your kid with food and sweets for finishing their meals, getting good grades, or helping you with household chores. Be Creative with Healthy Meals: Kids are known to dislike vegetables and fruits. Being innovative with the recipe and presentation, like adding cheese to vegetables they don’t like, or serving food in colorful moulds will make eating fun! Bunk the Junk: Keep a watch on your child’s junk food intake. Make sure your child does not eat too much of junk food like burgers, pizzas, cakes, and ice creams. Control Portions: Avoid serving large portions of food to your children. Trust their appetite and don’t force them to complete a meal. Keep the Idiot Box Away: Watching TV makes your child sedentary and obese. Make sure your child doesn’t watch TV for too many hours and especially during meals. Schedule a fixed TV watching time. Encourage Outdoor Activities: Plan activities together as a family, play hide and seek with your kids, go trekking, or take your kids along with you for a morning walk. Put a limit on watching TV and video games and enroll them in sports or dance classes instead. Support Your Child: Support, understand, and encourage your child throughout their journey to weight loss and always remember to reward success with lots of appreciation and love. Childhood obesity is preventable when one has the right kind of knowledge about nutrition. 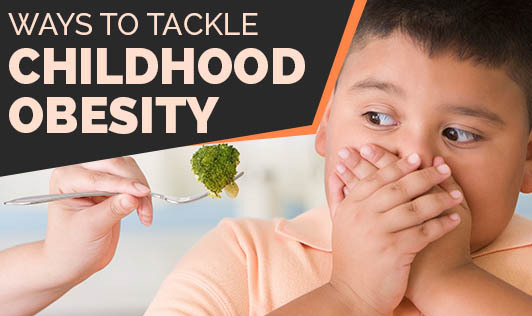 Encourage your kids to stay active and inculcate in them good habits about food and nutrition from a very young age, to avoid obesity and various diseases associated with it. A healthy childhood is the way to a healthy future!